Chocolate cake in a pan, is a simple recipe that you mix and bake the whole cake in a pan. You don’t even need a bowl for this recipe. This recipe is from my co-worker. This recipes was handed down to her by her mother in-law. This is a simple to make cake, and it doesn’t even need frosting. This easy to make chocolate cake can be made in the same pan that it bakes in. Put dry ingredients into sifter. Sift directly into un-greased 8x8 inch cake pan. Make three holes in dry mixture. Pour oil into first hole, vinegar into second hole, & vanilla into third hole. Pour cold water over all. Stir with fork until evenly blended. Bake 35-40 minutes at 350F. 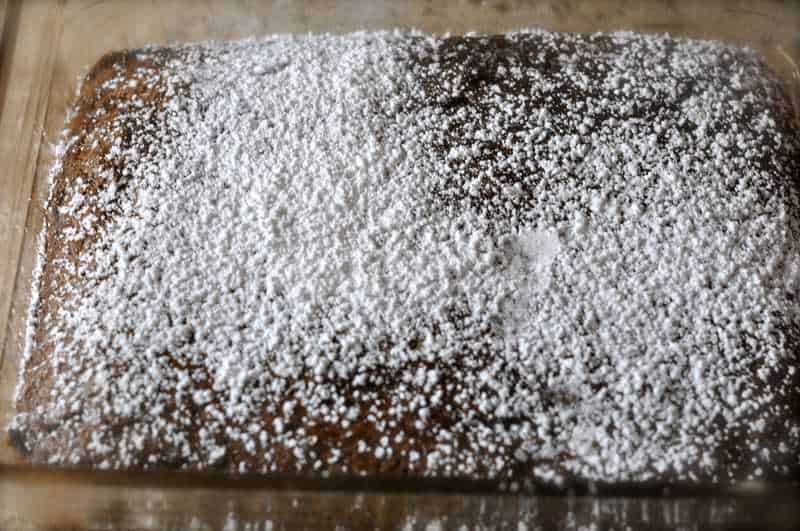 May be dusted with powdered sugar. Loved this cake I think it would also be good for the kids to make this! It would be great to make a cake with them and then not to have a huge mess to clean up after.